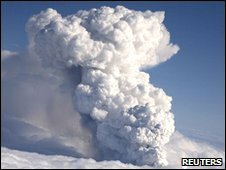 Flights in and out of England's airports remain suspended overnight after ash from a volcanic eruption in Iceland drifted across the country. All non-emergency flights from airports across the UK are grounded until at least 1300 BST on Friday. The Air Traffic Control Service (Nats) imposed the restriction in line with international policy because of the danger to aircraft. Tiny particles of rock, glass and sand in the cloud can damage engines. Initially, Nats said all flights would be grounded from 1200 BST until 1800 BST on Thursday. That was later extended to 0700 BST on Friday. Information from the Met Office was reviewed at 2000 BST on Thursday and the flight restrictions were further extended. In a statement Nats said the situation was not improving with any certainty. "We continue to work closely with airports, airlines, and the rest of Europe to understand and mitigate the implications of the volcanic eruption", it said. Nats said it could not recall a time when controlled airspace had been completely shut down in the UK. The company defended its action, stressing that volcanic ash was a threat to aircraft. Manchester, Liverpool, Stansted, Newcastle, Southampton, Birmingham, East Midlands, Leeds Bradford, Bristol, Gatwick, Heathrow and Blackpool were already badly affected on Thursday morning. Thousands of passengers across England were left stranded, waiting to hear what was happening with their flights. At Stansted, bride-to-be Sonal Valani, 24, was hoping to fly to Majorca for a hen weekend with a group of friends. She said: "We're just waiting to hear whether we can go. "We're just trying to find out what's happening. It will be very disappointing if we have to cancel." 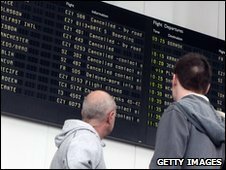 At Manchester Airport, flight information boards showed scores of cancellations. About 3,600 passengers had been scheduled to depart on 47 flights from Leeds Bradford Airport. Airport development director Tony Hallwood said: "We've never experienced anything quite like this before. It is unique. "Our staff have been working right through the night to ensure that our passengers are looked after and fully informed." 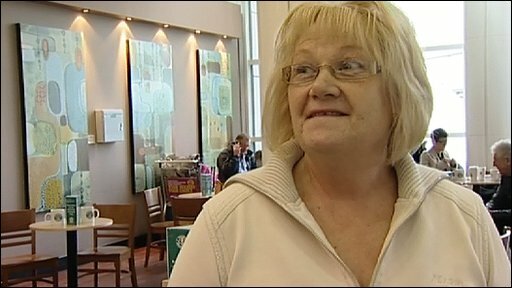 P&O Ferries has called in extra staff to cope with a surge of calls from stranded air passengers. The ferry company said it has been inundated with calls as a result of the closure of UK airspace. "Nats has good cause to be very cautious about this because in about 1982, a British Airways jumbo had the unnerving experience of having all four engines shut down as it flew through a plume of volcanic ash," he said. The ash cloud has also affected air ambulances in parts of England. The Yorkshire Air Ambulance, the East Anglian Air Ambulance and the Great North Air Ambulance's rescue helicopters were grounded. All five helicopters from West Midlands Ambulance Service were unable to fly, with crews redeployed into rapid response cars. Kent Air Ambulance said it was monitoring the situation, but would fly if necessary. A critically ill patient had to be flown from Scotland to London by military helicopter, which was the only aircraft suitable to make the journey. At RAF Wittering in Peterborough, at least 14 Harrier jets used to train pilots with No IV (Reserve) Squadron were grounded. Fighter aircraft at the RAF Lakenheath US base in Suffolk were also prevented from flying.